a kigo for all summer. In the month of July there are especially many festivals in Japan. Since the traditional festivals were directed toward the deities to pray for a good harvest, rain, no drought, not too many incects to destroy the harvest and so forth, July was an important season, after the rice planting, to care for the rice paddies. Festivals of Japan, before you carry on here. Matsuri are an important part of farmers' lives and later of the lives of townfolk, like Kyoto and Edo. There are also many kigo associated with matsuri, let us look at some of them. They are all kigo for all summer. ..... Indicating a festival that started in the evening and went on for the next day. ..... Painted with special patterns and figures for a festival. ..... Literally: Shadow Festival. This was held in some years as a smaller version than the official one. Sometimes the official festival was every second or sixth year only, to avoid too much splendor or spendings for a community. ..... Ladies wear light summer kimono or yukata. Men wear happi coats and leggins or other group dresses.
. Hikiyama 曳山 large festival floats　. 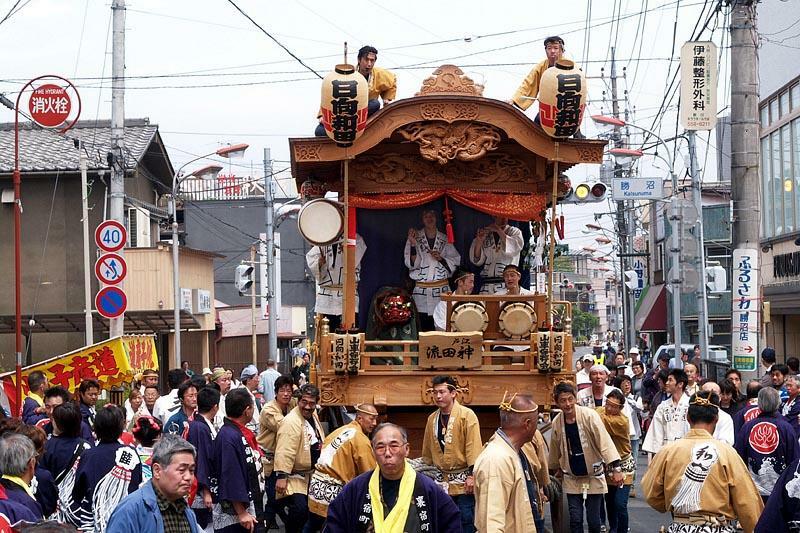 another word for a large mikoshi with four wheels to carry a heavy load. of festival floats . . .
. Buson and Botan Peony Haiku . Every year in summer the Austrian town Salzburg invites to visit the Salzburg Festival (operas, concerts). Famous musicians, singers from all over the world come to Salzburg and are worth that so many visitors sweat in the queue for tickets. Great link to photos of various festivals, with the matsuribayashi, the orchestra of drums and flutes playing. This takes a while but it will get you right in the mood of matsuri. Copyright (C) 2000-2005 Yoshio Wada. Issa has more than 25 haiku about various matsuri. Autumn means a good harvest.
. Festivals around Tokyo, January 2006 .